"Southwest Books of the Year 2001"
Southern Arizona is one of the premier birding locations in the United States. A Guide to Southern Arizona Bird Nests & Eggs gives birders, naturalists and visitors to the region information on desert nests in this world-renowned birding hot-spot. Each entry includes Nest Shape and Material, Habitat and Location, Eggs, Possible Builder, Natural History, Diet and Feeding, and Similar Nests. 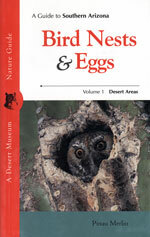 A Guide to Southern Arizona Bird Nests & Eggs is written in a jargon-free, conversational manner. The book includes a number of anecdotal and informational sidebars, as well as 20 finely-rendered illustrations, 43 color egg illustrations, and 32 color photographs of birds and their nests. A nesting-dates chart and glossary are also included. Pinau Merlin has lived in the desert Southwest for more than 3 decades, a good part of that time in its wilderness areas. She leads natural history expeditions in the United States and Mexico, presents interpretive programs, and designs wildlife habitat and nature trails. She is the author of two ASDM Press books, including A Field Guide to Desert Holes, and was a major contributor to A Natural History of the Sonoran Desert, an award-winning ASDM Press / University of California Press co-publication.